Since I started reading about the MSA (Middle Stone Age, the main African Middle Paleolithic stone industry) I have been under the impression that it had Solutrean affinities. Well, now it is confirmed that at least some MSA crafters, those from Blombos Cave, South Africa, effectively used this technique some 35,000 years before it was known in Europe. Vincent Mourre et al. Early Use of Pressure Flaking on Lithic Artifacts at Blombos Cave, South Africa. Science 2010. Pay per view. 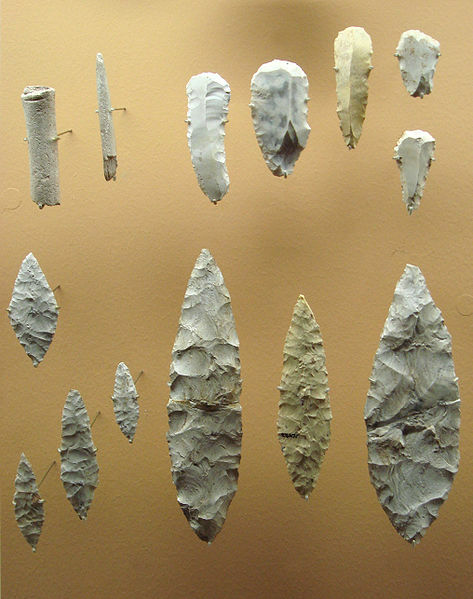 Pressure flaking has been considered to be an Upper Paleolithic innovation dating to ~20,000 years ago (20 ka). Replication experiments show that pressure flaking best explains the morphology of lithic artifacts recovered from the ~75-ka Middle Stone Age levels at Blombos Cave, South Africa. The technique was used during the final shaping of Still Bay bifacial points made on heat-treated silcrete. Application of this innovative technique allowed for a high degree of control during the detachment of individual flakes, resulting in thinner, narrower, and sharper tips on bifacial points. This technology may have been first invented and used sporadically in Africa before its later widespread adoption. Very few stones types (obsidian, jasper, high quality flint) can be retouched this way without previous thermal modification (heating the stone appropriately). This was the technique used at Pinnacle Point, not far from Blombos in that very same time. The technological sophistication is such that it has been compared to metallurgy. While Pinnacle point offered the first evidence of stone preparation through heating in order to improve knapping, Blombos has the first one of pressure retouch. Other evidence of the so-called modern behavior (symbolism, art, etc.) is also abundant in the South African MSA. Even food processing is known from that time in nearby Mozambique. 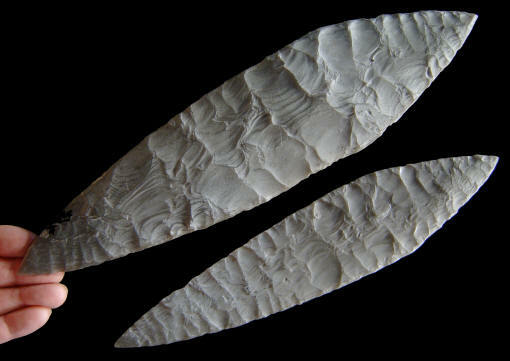 A cast of a Solutrean “laurel leaf” spear point, over 13 inches long. These delicate and beautiful implements were prepared by delicate flaking across the surface. Many are so large and delicate that they could never have been actually used, and may have been status objects. A more complete toolkit from Solutré-Pouilly. Another culture that used the same technique later on was Clovis culture in Holocene North America. Do health and reproductive drive cancel each other? This seems to be the case in a population of feral sheep from a remote Scottish island. Individuals with better immunity, and therefore longer-lived, do not manage to reproduce as successfully as their less healthy peers. However, in the long run they compensate that by participating in more reproductive seasons over their lives. The two tendencies in dynamic equilibrium run along families. Full story at Science Daily. Ref. Andrea L. Graham et al. Fitness Correlates of Heritable Variation in Antibody Responsiveness in a Wild Mammal. Science, 2010. Pay per view. Deposits of soluble minerals under the wheels of the trapped Mars rover but not in the upper layer support that water existed in liquid form recently on the red planet, otherwise the layers should be mixed by wind erosion. Very low mutation rate, mwahahaha! I’ve been reading around about the publication of a paper on the 1000 Genomes Project and what seems most interesting is that the observed mutation rate in humans would be of 1.1 x 10⁻⁸, much less than usually accepted. John Hawks seems particularly affected by the repeated observation of this rate, which he had previously discussed in March (on another different paper), up to the point that he seems about to accept the reality of such a slow molecular clock. For me it is one of those moments when I can nag: I told you so. Well, not just me but actually I’ve been drinking from various more academic opinions: zoologists having an issue with monkeys having to swim across the Ocean, Neanderthal experts scratching their heads when they read that we diverged only as little as 400 millennia ago, the Denisova sequence not fitting with any known migration, penguins that must be two to six times older than the molecular clock allows, bonobos that should have diverged a lot earlier than the tic-tac visionaries can tell, etc. Other elements of interest may be the finding of many previously unknown alleles, which, unlike those known earlier are rarer and found often only subpopulations, rather than wildly scattered through the planet. Also that brain-related gene duplications may be at the root of human intelligence, when compared with other great apes (see Science News). Kerguelen mice: a model for human expansions? I will today stop at a new genetic paper that does not deal with humans but with a not-so-distant relative: house mice. Specifically with mice in the remote Kerguelen islands, which have been known to humans (and hence to mice) only since 1772. Emilie A. Hardouin et al., House mouse colonization patterns on the sub-Antarctic Kerguelen Archipelago suggest singular primary invasions and resilience against re-invasion. BMC Evolutionary Biology 2010. Open Access. Starting from Western Europe, the house mouse (Mus musculus domesticus) has spread across the globe in historic times. However, most oceanic islands were colonized by mice only within the past 300 years. This makes them an excellent model for studying the evolutionary processes during early stages of new colonization. We have focused here on the Kerguelen Archipelago, located within the sub-Antarctic area and compare the patterns with samples from other Southern Ocean islands. We have typed 18 autosomal and six Y-chromosomal microsatellite loci and obtained mitochondrial D-loop sequences for a total of 534 samples, mainly from the Kerguelen Archipelago, but also from the Falkland Islands, Marion Island, Amsterdam Island, Antipodes Island, Macquarie Island, Auckland Islands and one sample from South Georgia. We find that most of the mice on the Kerguelen Archipelago have the same mitochondrial haplotype and all share the same major Y-chromosomal haplotype. Two small islands (Cochons Island and Cimetiere Island) within the archipelago show a different mitochondrial haplotype, are genetically distinct for autosomal loci, but share the major Y-chromosomal haplotype. In the mitochondrial D-loop sequences, we find several single step mutational derivatives of one of the major mitochondrial haplotypes, suggesting an unusually high mutation rate, or the occurrence of selective sweeps in mitochondria. Although there was heavy ship traffic for over a hundred years to the Kerguelen Archipelago, it appears that the mice that have arrived first have colonized the main island (Grande Terre) and most of the associated small islands.The second invasion that we see in our data has occurred on islands which are detached from Grande Terre and were likely to have had no resident mice prior to their arrival. The genetic data suggest that the mice of both primary invasions originated from related source populations. Our data suggest that an area colonized by mice is refractory to further introgression, possibly due to fast adaptations of the resident mice to local conditions. The abstract alone is quite explanatory. I must say that the reason for the refraction may not be adaptations to local conditions as much as mere demographic pressure: any new mice would be automatic minority and have poor chances of perpetuation, even in the absence of adaptations. Numbers alone make the difference, proving statistically difficult for any new arrival to leave a mark after the first population is consolidated. In the mitochondrial D-loop sequences, we find several single step mutational derivatives of one of the major mitochondrial haplotypes, suggesting an unusually high mutation rate, or the occurrence of selective sweeps in mitochondria. The mutation rate does not look too striking to me: 200 years for mice is like 10,000 for us maybe, as they reach reproductive maturity in a matter of months. So it’s like one (or two in a few sub-lineages) surviving mutations downstream of the founder haplotype, which is anyhow still massively dominant. In other words: there were some distinct founder effects of some derived haplotypes, mostly in Kerguelen itself but also overseas: in Falkland and Auckland islands and even back to Europe (Britain). 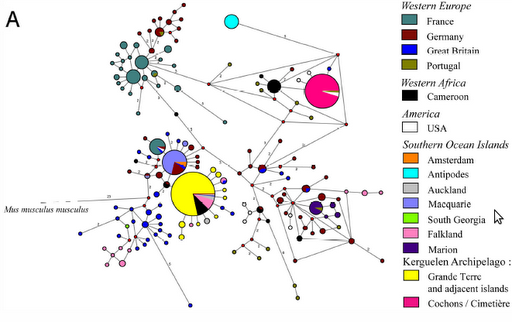 The diversity of derived basal lineages clearly indicates that this Kerguelen haplotype (yellow) exploded in the islands, regardless that it may be original from mainland Africa (black) and regardless that it has also spread overseas. This in the equivalent of 10,000 human years (very roughly). It reminds me somewhat of what we can see in Eurasian human mtDNA, with the yellow lineage resembling human mtDNA M somewhat and the magenta one like N. And that is one reason I wanted to comment this paper, really. Of course the stage of diversification and other aspects are clearly different but it does illustrates how founder effects proceed and how demic pressure alone tends to fend off new colonizations. The Zhirendong jaw from Guangxi Zhuang (South China) was discovered in 2007 (but I did not know until late 2009). Its most striking characteristic is the chin, which is a trait typical of Homo sapiens. Now a paper co-authored by palaeontology superstar Erik Trinkaus says we are before a modern human jaw, maybe admixed with other Homo species. Wu Liu et al., Human remains from Zhirendong, South China, and modern human emergence in East Asia. PNAS 2010. Pay per view (depending on your country and for six months only elsewhere). The 2007 discovery of fragmentary human remains (two molars and an anterior mandible) at Zhirendong (Zhiren Cave) in South China provides insight in the processes involved in the establishment of modern humans in eastern Eurasia. The human remains are securely dated by U-series on overlying flowstones and a rich associated faunal sample to the initial Late Pleistocene, >100 kya. As such, they are the oldest modern human fossils in East Asia and predate by >60,000 y the oldest previously known modern human remains in the region. The Zhiren 3 mandible in particular presents derived modern human anterior symphyseal morphology, with a projecting tuber symphyseos, distinct mental fossae, modest lateral tubercles, and a vertical symphysis; it is separate from any known late archaic human mandible. However, it also exhibits a lingual symphyseal morphology and corpus robustness that place it close to later Pleistocene archaic humans. The age and morphology of the Zhiren Cave human remains support a modern human emergence scenario for East Asia involving dispersal with assimilation or populational continuity with gene flow. It also places the Late Pleistocene Asian emergence of modern humans in a pre-Upper Paleolithic context and raises issues concerning the long-term Late Pleistocene coexistence of late archaic and early modern humans across Eurasia. Sources: NeanderFollia[cat] and Discovery News. On February, I wrote a ‘working note’ at Leherensuge on mitochondrial DNA stars. As I said then, star-like structures in haplogroups (stars for short) indicate rapid expansion in the time of few thousand years after a founder effect. They are in fact very hot markers in the genealogical tree. Many small stars also belong to these categories. However a number seem to happen relatively late, specially in West Eurasia (and occasionally Japan and America). Some stars also belong to the African geography but all happen in the earlier period (simultaneous to the main Eurasian expansion) with the only exception of the mother of all Eurasians (and many Africans), L3, which is necessarily older than M and, therefore, is the first star-like structure one can detect in the human matrilineal genealogy. While the mtDNA phylogeny goes a lot deeper than L3, there is no sign of strong rapid expansion before this matri-clan. This may be a time marker and may refer to the Abbassia Pluvial, c. 120-90 Ka ago. L3 in East Africa (Sudan-Ethiopia-Eritrea) – Abbassia Pluvial? W in West Asia, B2 in America (updated). Size code: largest type: giant stars, large type: medium and large stars, normal type: small stars. Note on chronology: My understanding of the molecular clock is that you must count from up-down, i.e. from older to younger node. This is different than most geneticists would do, what explains their failure in providing archaeologically reasonable dates, because they need to average the length of downstream branches, causing massive distortions. In my understanding, large haplogroups tend to remain stable as the dominant lineages generally ‘win’ the tug-of-war of genetic drift, so mutations tend to accumulate specially in smaller haplogroups, belonging originally to small isolated populations where drift would be more purely chaotic (similar odds for all existing lineages, as they were all similarly tiny). All secondary star-like (fast) expansions of R happen in West Eurasia except P (Melanesia). The same can be said of N, except for A (NE Asia). All secondary star-like (fast) expansions of M happen in NE Asia, except the first ones, which happen in South Asia. The expansion of C, D4a1, A2, R2a, H2a and U6a (soon after, Gravettian era?) – it is more regionally-specific than the others, as there are no Tropical African lineages involved.